Thousands of people have joined a demonstration in Madrid in support of Spain's best known judge, on trial on charges of exceeding his powers. Baltasar Garzon has won world-wide fame by initiating a series of high-profile human rights indictments. But he is on trial in Spain's Supreme Court after two right-wing groups accused him of violating a 1977 amnesty law by investigating Franco-era crimes. Judge Garzon maintains that no amnesty can cover crimes against humanity. 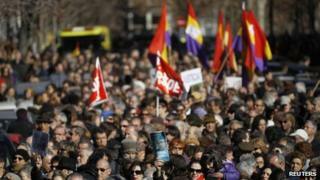 Politicians, prominent artists, union groups and actors were among the thousands of protesters in Madrid carrying placards saying "Garzon, friend, the people are with you" and "We demand justice". "I came to demonstrate against the injustice the judge faces and in memory of my grandfather who suffered repression under Franco," said one protester, David Ortega. Singer-songwriter Raul Anoz said he was at the rally because it was "unjust to try a judge, whose job is to investigate crimes, for looking into cases simply because they are controversial". Judge Garzon is considered a hero by rights groups, but he sparked anger in 2008 by investigating the disappearance of tens of thousands of people during the Franco era, including ordering the excavation of mass graves. Fascist leader General Francisco Franco ruled Spain from 1939, the end of the civil war, until his death in 1975. The case has reignited the debate about the way Spain has dealt with its past. Two organisations - Cleans Hands and Liberty and Identity - accused him of reopening war wounds and opened a civil case against him. Mr Garzon's defence has called for the case to be dropped - a move backed by public prosecutors. He is also facing two other court cases on charges of dropping an investigation into the head of Spain's biggest bank, Santander, and illegally authorising police to record conversations between lawyers and clients. If convicted at any of the trials, he could be suspended from the legal profession for up to 20 years, in effect ending his career.